After your day exploring the Central Otago region, choose from one of our warm and inviting luxurious boutique bedrooms in our award-winning Wanaka accommodation. Each room is individually decorated with iconic New Zealand themes, including artworks from local Central Otago artists. 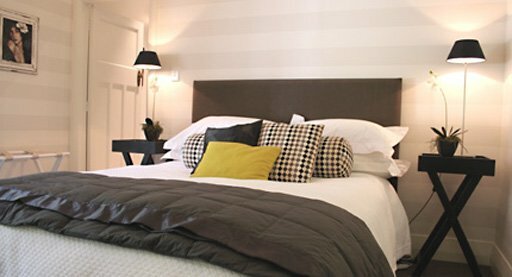 The finest linen and goosedown underlays, duvets, quilts and pillows are used to dress the lodge’s extra comfortable beds. The bathrooms all have under-floor heating, heated mirrors, towelling robes, luxurious towels, hair dryers and boutique bathroom products. You can take in the stunning views onto the garden and surrounding mountains from the adjoining decks on all the guest bedrooms. The colours of the surrounding mountains and lakes are reflected in the contemporary peacock blue and turquoise tones of this boutique queen-size room. Take in the stunning mountain views of Mt Cardrona while you enjoy a gourmet breakfast from the privacy of your own deck, or simply watch a stunning sunrise from the luxury of your warm bed. The fully appointed ensuite bathroom has luxury towels, soft robes and toiletries for your personal use. TV/DVD and wireless internet access are all available in the room. Relax in the stylish and soothing surroundings of the soft grey and cream tones of the Hukapapa Room. Your Queen bed is so wonderfully comfortable, your sleep so tranquil – you may not wish to leave it! French doors take you onto the adjoining deck with views onto the garden, woodland and adjacent stream. The ensuite bathroom is tastefully decorated with Italian tiles and stocked with fluffy towels, robes and boutique products. 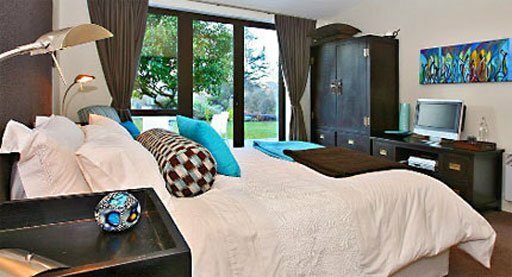 The Harakeke family-sized room offers supreme comfort. This spacious room is decorated in the warm and natural colours which reflect the distinctive Central Otago terrain. This bedroom can sleep up to 3 people with a King/ twin single bed and an additional single bed.